Our parents John and Daphne Oram collected the family history and produced a booklet in 1970 called The ORAM Family Saga. This saga concentrated on the life stories of John Oram 1824-1907 and his descendants. John was born and died in the Sparkford / Castle Cary area of Somerset but spent most of his working life in County Mayo, Ireland as an agent for an ‘absentee landlord’. These oral traditions form the core of a website that we hope to make public in 2014. In this website we follow the family trees of John’s other relations named in the bible, and in some cases the families of their spouses. These were not covered in The ORAM Family Saga booklet, but because of the advent of the internet are better known to us. Our genealogical tree is one of the topics covered under the ‘About’ tab and includes extracts from the Introduction of The ORAM Family Saga. The ‘Isaac’ tab leads to a page on Isaac born 1745. This our includes research on his parents and how, when Isaac was a young child the family moved from Castle Cary to Ditcheat. There are also notes on the Oram’s connection with Ditcheat over the centuries. The ‘Isaac’s son John b1772’ tab leads to pages with the results of our research into this section of our family. Nearly all the information is given under the entry for John 1800-1891. The most useful sources were the ten yearly census returns that began in 1841 and the centralised birth, marriage death records that started in 1835. ‘Isaac’s son James b1774’ is our great-great-great grandfather. Under this tab we have pages for James, his wife Susannah, and their offspring except John Oram 1824-1907. 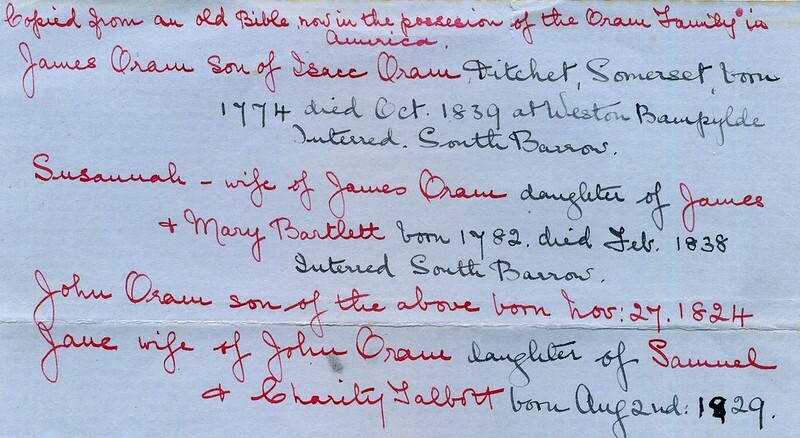 The lives of John and Jane (nee Talbott) Oram and their descendants are the subject of another website that is under development. Under ‘Isaac’s son James b1774’ we explore the lives of John’s siblings and their descendants. This introduces a number of local families including the Hockeys who were local butchers, the Cox family and the horse dealing Guppys. The Guppys seem to be the most interesting branch that included a court case following the death of Albin Guppy. The ‘Associated families’ tab leads to areas for the family history of people who have married one of the direct descendants of Isaac Oram. We invite direct descendants of Isaac and their sibling-in-laws to contribute to this site, either within the main Oram area or as one of the ‘Associated Families’. We have left ‘Local history’ a blank canvas in the hope that local historians will help us develop this part of the site. So probably not direct but associated. Sorry I got that wrong after looking at your associated families. Ediths Cousin. I can give you detailed family details for the Australian branch as I have research backed up with secondary sources and copies of BDM records, headstones, war records, some photos etc and all on ancestry.com for Bartlett/Whitting family.